The royal family has been setting fashion standards since long before Kate Middleton and Meghan Markle became household names. 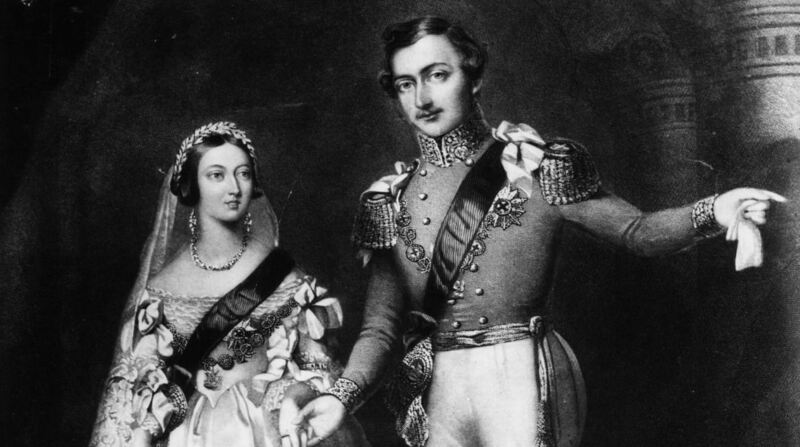 More than 175 years ago, the wedding dress Queen Victoria wore when she married Prince Albert in 1840 made a major statement. Victoria's off-the-shoulder satin gown was covered in delicate lace, but most impressively of all, it was the color of snow. Wedding dress styles have changed a great deal since the Victorian era, but the light color palette has more or less remained a constant, according to Vanity Fair. White wasn’t always the obvious choice, though. Prior to Queen Victoria’s royal wedding, red and other bright hues were the go-to colors for would-be brides. While Queen Victoria is largely credited with being the person who popularized the white wedding dress tradition as we know it today, she wasn’t the first woman to wear white on her wedding day—or even the first royal bride to don the the color (Mary, Queen of Scots opted for white when she married the Dauphin of France in 1558). While some accounts have suggested that Queen Victoria wore white as a symbol of her sexual purity, historians have pointed out that wearing white was more of a status symbol. Wealthy brides wore the color to flaunt the fact that they could afford to have the dress cleaned—a task that was notoriously difficult in those days. "Before bleaching techniques were mastered, white was a rare and expensive color, more a symbol of wealth than purity,” biographer Julia Baird wrote in Victoria: The Queen. “Victoria was not the first to wear it, but she made it popular by example. Lace makers across England were thrilled by the sudden surge in the popularity of their handiwork." Eventually, white weddings became the standard—particularly once synthetic fibers became widely available (and cheaper than satin). With that, the “definitive democratization of the white wedding gown” was complete, Carol Wallace wrote in All Dressed in White: The Irresistible Rise of the American Wedding.